Investors with a time horizon of 5 years or more should stick to equities and alternative investments rather than bonds or cash, according to a Credit Suisse study analyzing the period 2015-2020. A comprehensive analysis of the total return estimates, volatilities and correlations of 75 asset classes over the next five years can be found in Credit Suisse's Capital Market Assumptions (CMAs). The analysts at the bank's Investment Strategy department examined three scenarios: a main scenario, as well as a weak and a strong risk scenario. These sets of figures form the basis of any detailed portfolio review carried out by Credit Suisse. The latest update of the bank's CMAs was released in October 2015. "Our state-of-the-art techniques to estimate returns, volatilities and correlations signal that most developed economies will converge to their potential within a more stretched cyclical recovery than usual. Inflation is forecast to remain low in most developed economies, supported by real interest rates remaining predominantly zero to negative over the next five years," explained Nannette Hechler-Fayd'herbe, Head of Investment Strategy at Credit Suisse. The CMAs' gross domestic product (GDP) growth forecasts reflect the evolution of the working age population and labor market participation rates, as well as productive capital and productivity growth. "We assume that the better integration of women and elderly workers in the labor market will support the labor force participation. However, the expansion of potential employment growth is generally limited by an ageing population," noted Sara Carnazzi Weber, Fundamental Macro Research. Potential economic growth is, thus, primarily as a result of their respective demographics, the highest in the US and the lowest in Japan, with the Eurozone ranking among the lower potential growth areas behind the UK and Switzerland. The overall recovery of the world economy is likely to trigger an increase in investment given the higher demand, which in turn should lead to a rise in productive capital growth above the levels recorded after the financial crisis of 2008. The view on potential productivity growth is more subdued due to the slow adoption and speed of diffusion of existing and new technologies. There is usually a time lag before the full benefits of innovations can be reaped. The lag between investments in information and communications technology (ICT) and improvements in productivity, for instance, has been estimated to be between 5 and 15 years. Conditioned by the financial crisis, the investment environment has considerably worsened, leading to lower investment growth and a rising number of poor performing businesses. In our view, this is currently restraining the ability to adopt new technology. The projected US GDP growth will probably allow the Federal Reserve to begin to raise its interest rates in the early part of the five-year period, with the Bank of England following suit shortly thereafter. Credit Suisse does not expect the European Central Bank and the Swiss National Bank to start raising their rates before the end of 2018, at the earliest. "As a result, very low or even negative cash returns are assumed in our main scenario. In the upside risk or 'strong'scenario, short-term interest rates rise earlier than in the main scenario, given more positive growth dynamics and an earlier increase in inflation. In the downside risk or 'weak' scenario, central banks are assumed to keep interest rates low for most of the five-year horizon," Björn Eberhardt, Head of Global Macro Research said. The continued low interest rate environment will continue to weigh on core government bond returns, which are likely to generate low or even negative total returns over the next five years. "The best performance is expected for non-core fixed income such as lower-rated credits (corporate bonds) and convertible bonds," said Sylvie Golay Markovich, Head Fixed Income Analysis. As the figure below also shows, cash returns will not generate attractive total returns. So which are the asset classes expected to offer positive excess returns over the next five years? Equity returns compare favorably to both cash and bonds, with excess returns in the upper range of historical observations. "This view is consistent with our GDP growth assumptions as well as the continued zero to negative real interest rate regime, and in the upper range of historical annual 5-year returns," said Gerald Moser, Head of Equity Analysis. "Emerging market equity returns are not likely to outperform those of developed markets, given higher discount rates," he added. Within emerging markets, those located in Europe are those with the most potential to outperform. 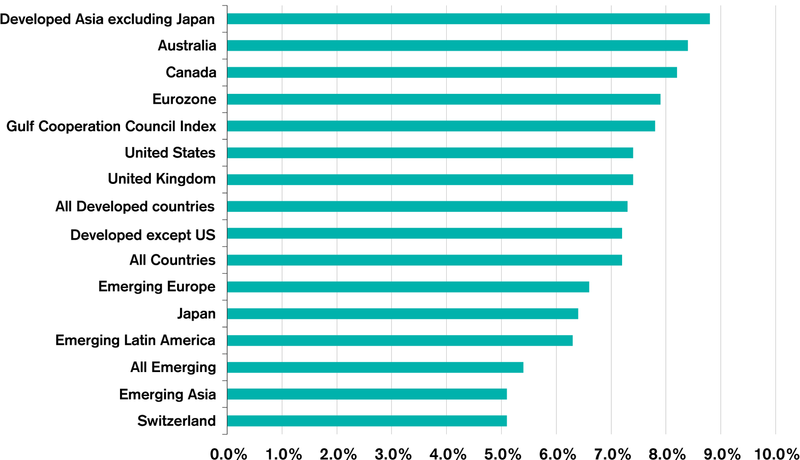 Switzerland and Japan are likely to trail other developed market equities, while Australia and Canada as well as developed Asia (excluding Japan) are the equity markets with most growth potential over the next five years. Among US equities, master limited partnerships (MLP) are forecast to outperform. "Within alternative investments, private equity, hedge funds and Asian real estate should perform better than commodities, gold and global real estate," said Tobias Merath, Head of Cross Asset and AI Analysis. "Alternative investments still offer an attractive risk reward," he added. It is important to note that although private equity in particular is likely to deliver the highest returns over the next five years, investments in this asset class are out of reach for most investors. The minimum amount that needs to be invested typically exceeds 250,000 US dollars. Private equity returns are forecast to exceed 10 percent over the next five years. Hedge fund returns are seen lower in the mid-single-digit range over that period. Real estate is expected to outperform core government bonds as a result of the forecast economic growth and low interest rate environment. Commodities are set to underperform most other alternative investments, mostly due to persistent excess inventories. Gold's high sensitivity to both real interest rates and inflation should lead it to underperform the other commodities over the analyzed five-year period. "In currencies there is generally less upside for the US dollar, with the euro and the two commodity currencies – the Australian and Canadian dollar – likely to gain slightly against the US dollar over the next five years," said Luca Bindelli, Head of Foreign Exchange Analysis. The Swiss franc will, however, probably weaken over time due to its current large overvaluation against the US dollar. The annual CMAs are the foundation of Credit Suisse's and our clients' strategic asset allocation reviews. These estimates notably support the wealth projections, portfolio drawdown simulations (measuring the decline between the peak to trough of a portfolio over a specific period) and risk controls carried out. The CMAs constitute a crucial working tool in any detailed portfolio review carried out by the bank.